The icy winds of the polar vortex have set US teeth chattering, blowing in a flurry of quirky results, from "frost quakes" to burning railway tracks – and a debate on whether Americans are going soft. Cryoseisms – also known as "frost quakes" – have been reported by Ohio and Pennsylvania residents who have been hearing loud booms from the ground. The quakes are caused when large amounts of moisture settle into the earth from snow and rain, then a rapid plunge in temperature causes the ice to explosively expand. "It sounded like a big piece of furniture fell over," Dillsburg, Pennsylvania, resident Michelle Tebbetts told WHP-TV. "These frost quakes, they sound more like a boom or a bang and then we get a little shake in the house," said Steven Tebbetts. Kentucky Governor Matt Bevin, whose state is experiencing temperatures of -14C (6F), lamented school closures in a radio interview on Tuesday. "I mean, what happens to America?" the Republican said, twice adding: "We're getting soft." "I'm being only slightly facetious," he said, "but it does concern me a little bit that in America on this and any number of other fronts, we're sending messages to our young people that if life is hard you can curl up in the foetal position – somewhere in a warm place – and wait till it stops being hard, and that just isn't reality, it just isn't." The Kentucky Education Association said in a statement on Twitter: "We will always support decisions made for the health & safety of Kentucky's children. Always." NBC news national meteorologist Al Roker condemned Mr Bevin as a "nitwit governor" on Wednesday. Others have been taking to social media to dare him to spend more than 15 minutes outside in the cold. Commuter train tracks in Chicago have been set ablaze as transit workers try to keep the steel from freezing, so trains can keep moving. Overhead video captured by news helicopters show flames licking the rails. "Basically, what the fires are, they're gas powered switch heaters and essentially you're looking at a giant gas grill," Metra Commuter Rail spokeswoman Mel Riele told the Chicago Tribune. The heat from the fire keeps the metal from contracting, causing fractures in the tracks, and also prevents switches from freezing or bolts coming out of the rails, she said. Residents in at least 10 US states won't be receiving their mail on Wednesday, as the chill has caused the US Postal Service to cancel deliveries. It's not the first time that mail has been cancelled due to weather, but typically that has been due to massive amounts of snow accumulated on roads by drifting winds. So much for the US Postal Service's unofficial motto: "Neither snow nor rain nor heat nor gloom of night stays these couriers from the swift completion of their appointed rounds." The National Weather Service has warned that people in Iowa should "avoid taking deep breaths" and "minimise talking" while exposed to the cold. "Dry, extremely cold air can irritate the lungs, cause shortness of breath and trigger asthma attacks for those with lung-related diseases like asthma," the American Lung Association said in a warning. If you must go outside, be sure to cover your face and mouth with a scarf or mask to warm the air you inhale, experts say. Temperatures in the town of Hell, Michigan – its actual motto is "Go to Hell" – have hit -22F (-30C), cueing up a somewhat predictable gag. Chicago's production of the musical Hamilton has been cancelled, leading to this history buffs' joke. It's a reference to US Treasury Secretary Alexander Hamilton's duelling death at the hands of then-US Vice-President Aaron Burr in 1804. 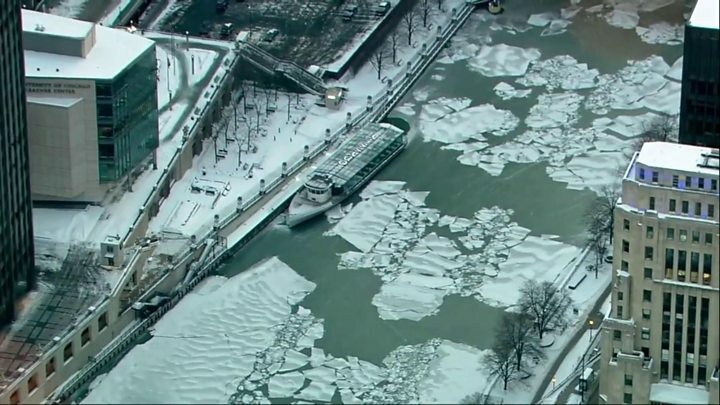 Some Chicago residents have blended their city's name with Siberia, Russia – dubbing it "Chiberia". Buffalo Zoo in upstate New York is closed on Wednesday because of the weather, but that's just fine by its resident polar bear Sakari. Chicago's Brookfield Zoo as well as the city's Lincoln Park Zoo are both closed and most animals will be brought indoors, representatives said. But polar bears and other species specially adapted to extreme cold, such as Arctic foxes and penguins, will be allowed to remain to frolic in the snow and ice. Across the internet, people are throwing cups of boiling water in the air, with the liquid immediately turning to ice crystals that appear as vapour in the dry air. The viral sensation is proving especially popular among meteorologists, science teachers, and children who have been told to stay home from school due to the conditions. Other have taken to filling water pistols with boiling water to create steaming arcs across their backyards. Others are blowing soap bubbles and watching them freeze into an icy sphere in midair. Police in McClean, Illinois, posted a photo of a staged arrest of Elsa, also known as the Snow Queen from Disney's 2013 film Frozen. "Due to the EXTREME COLD weather, all criminal activity and acts of stupidity and foolishness has been cancelled… Even Elsa has been placed under arrest with NO BOND until further notice," they wrote in a Facebook post. The image was originally posted in 2015 by officers in Hanahan, South Carolina, but that hasn't stopped some from insisting they "let her go" in reference to the title of the Academy Award-winning song from the film.